Calculating Film Feet: Film transfer is priced by the film foot. The table below calculates the amount of film feet. Enter the number of each size film reel in your collection, in the table below, to figure out how much total film footage you have. Each order is a custom job, and final quantity of film feet can be impacted by removing damaged or blank film, or by the estimation of film feet being incorrect. We only charge for the actual number of film feet transferred. Scanning Process: All film conversion processes include film inspection, cleaning, and repair. We repair old splices, remove blank film and damaged perforations, and replace the leader if necessary. Prior to scanning your film, we carefully clean it with a special solution to remove dust, mold, and other contaminants from the film stock . We use high definition film scanners (models Sniper HDL, Sniper HD-Pro, and Sniper-16 HD) to digitally scan and record the entire contents of each frame of your 8mm, Super 8mm and 16mm film. 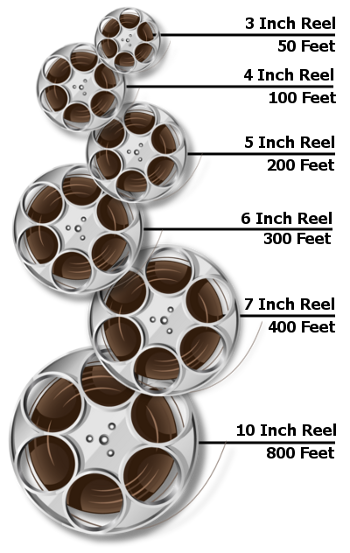 The captured film content is then reformatted / converted, and returned to you on a video DVD. Educational Video Library: Videos on our film transfer process, sample finished product, color correction, and comparsion to previous generation film transfer. Turnaround: Average turnaround is 2 weeks from receipt of your order into our lab back to your doorstep. Output: The video DVD is a DVD-R containing MPEG-2 video and audio files, is manufactured by either JVC Taiyo Yuden or Falcon, and has an advertised shelf life of over 30 years if stored properly. The movies are in standard definition, meaning 720 x 480p resolution, in a 4 x 3 aspect ratio, at 18 to 20 frames per second (fps) for silent film and 24fps for film with sound tracks. Our film scanners' frame-by-frame scanning of each film frame provides a superior, flicker-free movie. The DVD is set up for auto-play with chapter points at the beginning of every 400 feet of film unless specified differently. One DVD contains up to 2 hours of video, the equivalent of 1600ft of 8mm film transfer or 3200ft of 16mm film. We customize the table of contents menu and disc label with your family or company name. One (1) onscreen title is at beginning of the movie, example “Smith Family Home Movies”. The one on-screen title, disc surfaces and case sleeves are labeled per your instruction. Pricing: The price for standard definition film transfer to DVD is $0.17/ft. (17 cents per film foot) or $8.50 per 50ft (3 inch) film reel. Film with Sound: We can capture audio from sound strips on Super 8mm film and 16mm film. Price is $25 per 1,000 film feet. Our editors adjust and synchronize audio playback for best play. Worth the extra investment - adds significant value to final product. Instructions: When placing your order in our online ordering system, please include your instructions to us within the comments section. Be specific about how you want your final product output to be organized, file names, reel sequence, on-screen titles, any extra copies, etc. If we have questions about your order's instructions, we will email or call you. For additional customization of your film project, please review the optional add-ons at the bottom of this page. Extras: We offer options for background music ($10), on-screen titles ($5 each), basic color correction ($50), extra copies of the final master DVD set ($15 per extra copy), and LightJar private video cloud storage for backup copies of your order (just $10 first year). Shipping: A UPS shipping label can be created from our website for attachment to your inbound package to our labs. Shipping is free on orders valued at $100 or more. A $10 shipping and handling fee is applied for orders greater than $50 but less than $100; and a $25 shipping and handling fee is applied to order values less than $50. We offer a Safe Shipping Kit with a GPS tracking chip as an option, listed at the bottom of this page. Warranty and Protection - If we make a mistake, we provide a 90 day warranty on our work for editing changes or redo's if necessary. Our intent is for you to be satisfied with the finished product. All finished jobs are placed in network storage for 90 days as protection against loss or damage to the original order, or if the customer wants further editing or extra copies. Replacement cost is $15 for each replacement DVD. Film is inspected, repaired, and cleaned prior to scanning. Each film frame scanned individually; final movie presented in 720x480p standard definition, with 4x3 aspect, at 18fps or 24fps (16mm with sound). The DVD is set up for auto-play with chapter points at the beginning of every 400 feet of film unless specified differently. One DVD can contain up to 2 hours of video, the equivalent of 1600ft of 8mm film transfer or 3200ft of 16mm film. The custom table of contents menu and disc surfaces are labeled per customer instruction. See related products for options such as audio capture, background music, color correction, on-screen titles, extra copies, etc. From Susan Gillott of Miami, Florida on 8/6/2018 . Our film transfer was done highly professionally. I particularly like the opening frame with "scene selection" and accompanying boxes that show parts of film depicting what is in the scene. Music selection is also very appealing. We will recommend Cintrex AV to our friends because of the quality of their work and their excellent customer interaction! From Lorin of Mechanicsburg, Pennsylvania on 7/2/2015 . Received yesterday the finished DVD transfer of my short film. Many thanks for the fast service and completing this order as per my directions. It was a complete joy seeing this film again after 40 years. There will be several more shorts coming your way, which I am sure will receive the same professional attention in transferring to DVD. From Rolf Reynolds of Cochranton, PA, Pennsylvania on 12/15/2014 . Our committee members are very pleased with the quality of your work. Your service is superb with work completed within a very reasonable turn-around time. Thank you. I have personal films that I will be sending in the future. From Bridge61 of Germantown, Maryland on 12/11/2014 . I was very hesitant to send my treasured family movies away and did a lot of research on prices and the video process before I chose Cintrex AV. I am completely satifisfied with the end result. The time frame was excellent, the product is fabulous and the people are completely trustworthy. I'm so grateful for their excellent work and professional staff. From Ron Z of Lambertville, New Jersey on 12/1/2014 . I received the DVDs and you did a tremendous job . . . thanks for the good service.